(Youtube) Police close in on a wounded Malek F.
It was a warm afternoon in the Netherlands on May 5 as the country celebrated the 73rd anniversary of its liberation from the Nazi occupation. Some had gone to the beach. Others picnicked in local parks. 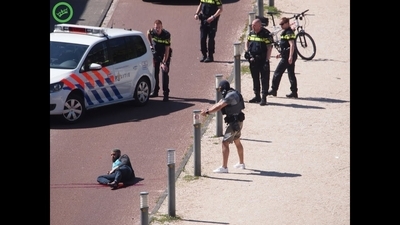 But in the streets beside the Hollands Spoor train station in The Hague, one man chose a different way to mark the occasion: brandishing a knife, he slashed at random bystanders, wounding three people, one seriously. Police rushed to the scene, where they shot the attacker in the leg to force him to the ground. Yet even as he lay across the sidewalk, he held tightly to his weapon. "Allahu Akbar," he cried out, the Arabic that means "Allah is greatest." Police arrested the Syrian-born attacker, later identified as "Malek F." But only hours later, authorities were forced to acknowledge that he had been in their sights for some time – not for radical Islamism, but for what they called "disturbed behavior." Media reports described the man as "troubled," and officials claimed they were searching for a motive. Even The Hague Mayor Pauline Krikke told the press that "terrorism has been ruled out as a motive," insisting "there is no sign that there was anything more to it" than that the man was mentally ill. Yet further investigation revealed that police had received an anonymous tip in March warning that Malek F, who has lived in The Netherlands since 2014, was planning an attack. This was not the first time this kind of situation has occurred. More and more, officials are starting to describe radicalized Muslims as "mentally disturbed" rather than "terrorists," and question whether their claims to act in the name of terror groups are real or imagined. At the same time, mental health experts are exploring whether mental health issues can make people – particularly refugees housed in asylum centers – vulnerable to radicalization. Take, for instance, the attack last December, when 29-year-old Palestinian-Syrian Saleh Ali smashed the windows of a kosher restaurant in Amsterdam, waving a Palestinian flag and again calling out the battle cry of "Allahu Akbar." He too was known by authorities who, as with Malek, ignored warnings that he had radicalized. Overlooking the fact that Ali had also fought in Syria, they instead referred him to mental health clinics, according to Dutch news channel NOS. Yet prosecutors charged him only with vandalism and burglary after the restaurant attack, and ordered him to continue psychological examinations while he awaits trial. Infuriated, the restaurant's owner is fighting to have Ali tried on terror or hate crime charges. His efforts thus far have failed with the public prosecutor's office citing a "lack of sufficient evidence." Or consider the case of Ahmed A, a Palestinian asylum seeker who used a stolen eight-inch knife to stab several people last July in a Hamburg supermarket, killing one of them. (Germany, like most European countries, does not identify those charged or convicted of a crime by their full name.) According to a Der Spiegel investigation, the attacker – whose "Allahu Akbar" rang through the supermarket aisles as he continued his slashing spree – had been previously referred to a "counseling center" for "psychological problems." At the asylum center where he lived, fellow residents and counselors simply called him "strange," and left it at that. Yet an effort by Ahmed A's friends to alert the authorities to his possible radicalization was misfiled by police, as happened with Malek F; and in November 2016, Ahmed reportedly announced at a refugee café that "Terror will come to this place, too." But no one paid attention. A similar story also surrounds the Tunisian-born Mohamed Lahouaiej-Bouhlel, who in 2016 drove a truck into Bastille Day revelers in Nice. He, too, according to the BBC, had a history of psychiatric problems, though his former psychiatrist told reporters that "he did not think the atrocity in Nice should be blamed on mental illness." Indeed, evidence shows Bouhlel plotted the attack methodically, doing extensive research on traffic accidents and reading up on the attacks by Orlando night club killer Omar Mateen and others. The irony is that Mateen's attack also was described by many as being motivated by emotional problems, the expression of a man dealing with conflicts over his own latent homosexuality, rather than terrorism. No evidence ever emerged to substantiate this theory. Further, even as he was shooting randomly at the Pulse nightclub, he pledged allegiance to ISIS in a call to the Orlando police. His ex-wife called him "bi-polar," though there is no medical evidence to substantiate this diagnosis. Nor would bipolarity explain Mateen's desire to align himself with ISIS or his fascination with Boston bombers Tamerlan and Dzhokhar Tsarnaev. This distinction matters. By dismissing terrorist attacks as violent outbursts of the mentally disturbed, we overlook actual threats to national and international security – with deadly consequences. Intelligence and policing strategies are doomed to misfire even as the real Islamist threat, inadequately checked, grows larger. At the same time, understanding the links that can exist between psychological problems and radicalization may help counterterrorist experts pinpoint those vulnerable to terror recruiters, and make them less likely to ignore the warning signs in people like Saleh Ali and Malek F.
"The apparent relationship between mental illness and extremist violence stands against a lengthy and well-evidenced tradition of terrorism studies showing that most terrorists are psychologically normal." It is clear, for instance, that the 19 September 11 hijackers were not all suffering from some sort of psychosis, nor is it believed that Osama bin Laden was psychologically unwell. Nonetheless, notes START, "for some individuals, intense feelings of injustice, outrage, revenge or even love can potentially act as mechanisms to push people toward extremist violence." Other studies have confirmed this assertion, including one by Paul Gill and Emily Corner of University College in London. They found that of 119 "lone wolf" attackers, almost 32 percent had been diagnosed as mentally ill, versus 3.4 percent of members of terrorist groups. But it is also critical to distinguish between psychological discomfort and mental illness. Many migrants and refugees face uncertain futures, which "contributes to mental illness" and anger, German psychotherapist Mechthild Wenk-Ansohn told Der Spiegel. This may or may not be true, but certainly cannot explain slicing the throats of pedestrians on a spring day in The Hague, or running down hundreds of people celebrating their national holiday in Nice, all in the name of Allah and the hope for martyrdom and eternal life. Nor does it explain the child suicide bombers in the West Bank or the marketplaces of Baghdad. More convincing is the explanation of Weill Cornell Medical College psychiatry professor Theodore Shapiro. "Mental illness per se is not specifically associated with any form of social violence," he told the IPT in an e-mail. "Rather, some mentally ill (paranoid and impulsive) persons may seek out and join common radical causes as a vehicle for discharging their hate and distorted thinking." In addition, Shapiro added, "Recent findings indicate that disorders such as PTSD, commonly associated with stress in wartime (shell shock, battle fatigue,) or terrorism only occur in those who have histories of significant illness such as anxiety disorders. Thus the stressor is a trigger for onset of the radical form of the disorder and not the full cause." Certainly, insanity has led people to kill – John Hinckley and Jeffrey Dahmer, for instance. But murder, even mass murder, is not terrorism. Terrorist violence is aimed at a higher purpose, or the belief in one: martyrdom, an Islamic caliphate, liberation, political revolution. And while insanity may increase the likelihood of radicalization, not all radicals become terrorists. What's more, calling a terrorist "insane" or "confused" does more than free him of responsibility: it makes him a victim, a sympathetic character worthy of compassion and concern. True, if a history of mental illness can signal a potentiality for radicalization, this is information security agencies should attend to better than they have to date. But to conflate the two risks normalizing terrorism as if it were any other form of violence, not the insidious, ruthless attack on our lives and our democracy that it is.